Happy Friday, everyone! It’s time for a Perfect Picture Book review and activity. Susanna Hill’s blog is the place to go to find a whole bunch of other picture book reviews. Spring is almost here – yes – can you hear the birds singing? Can you see the snow melting? I’m ready for Spring! My perfect picture book pick makes me think about spring. 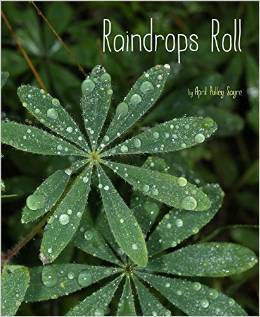 “Discover the wonder of water in this refreshingly fun and fascinating exploration of rain, raindrops, and the water cycle from the creator of Rah, Rah, Radishes! and Go, Go Grapes! Raindrops drop. They plop. They patter. They spatter. And in the process, they make the whole world feel fresh and new and clean. Discuss the effect rain has on the environment – what would animals and plants do without it? Because I believe 100% that exposure to good picture books gives children a great head start in life! I’ve been to every state except Alaska and I would love to go there one day – on a cruise. The first cross-country trip my husband and I took lasted 6 weeks – we went from NYC to Vancover, BC, then down the coast of Washington, Oregon and California to Ensenda, Mexico then to Las Vegas, on to the Grand Canyon and back to NY. Total cost including motels every night, breakfast and dinner every day, gas, admissions (Disneyland and many National Parks), souvenirs (like oil on velvet paintings and silver jewelry from Mexico) was $1200. Hard to believe. But see #3. I earned $100 a week in my first year of teaching kindergarten in the NYC public school system. My first international flight was probably the longest flight I could have planned – 24 hours of flight time from Colorado to Singapore. I LOVE air-popped popcorn sprinkled with Parmesan cheese and dark chocolate and ice cream (any flavor). I won a lindy dance contest with my husband many years ago. My favorite food is Indian –I learned how to make curries as a young bride because my hubby and I loved them so much. I know the award rules say I should name 15 people to pass the award on to. I also know that many of you are so busy, this would be a hardship. 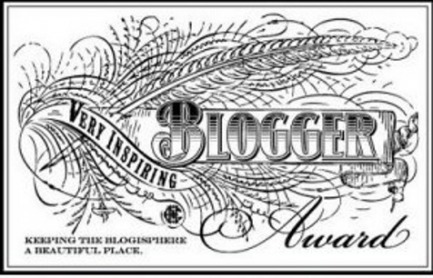 All of you inspire me – so I offer the award to all of you – please post it on your blog if you don’t already have it. This entry was posted in Ecology for Kids, Inspirational Blogger Award, Perfect Picture Book Friday and tagged April Pulley Sayre, Lauri Fortino, Raindrops Roll by viviankirkfield. Bookmark the permalink. So cool that you’ve been to so many states. My husband has been to all the connected states but not to Alaska or Hawaii. Maybe someday. I love curry dishes. You’ll have to message me your secret tips to making a great one. I have said this before but I’ll say it again. You works will sing because you are so dedicated and put some much work into revisions and in fact I can think of a few that already “sing” (my favorite being your Sara story). Six critique groups!!!! You put me to shame. I can’t even keep up with the three that I am in. I agree with you whole-heartedly. Exposure to good picture books is so beneficial to children. Lastly, I wish I could do the lindy. Such a cool dance. Somehow I don’t think my feet would cooperate. My secret to yummy curries is to add a bit of honey…I love when they are sweet. The sad thing is that hubby can’t eat spicy food anymore…so I rarely have it…but our daughter (and both sons) LOVE curries…so once in a while, I’ll go out with Carrie for Indian buffet. I am looking forward to reading this. It is so musical! Ooh I must try that popcorn! I love water books, I’ll have to look out for this one. Fun to learn more about you Vivian. Our library has this book, Vivian. I took a new neighbor and her little girl to a “tea party” and readings of some wonderful children’s books. This was one of her favorites. It is truly musical. I love the author’s other books (Rah! Rah!) and will be on the lookout for this one. My husband makes good curry–and now you have me wanting it. Raindrops Roll is my kind of story. Thank you for sharing it today as well as introducing me to an author I was unfamiliar with. Will add this to my list for our grandchildren. Okay, what is your tea laced with? You’re really bursting with energy today. Love all the personal shares. I’ve been to Alaska — while the glaciers were more prominent. Hope you visit some day. You will love it. More raindrops, fewer snowflakes. It’s been quite a winter for us in New England eh? Ooh! Intriguing book – I’ll look for it at the bookstore. But the best part of this blog post is learning more about you! Wish I’d known you when you lived in Colorado… but I’m so glad to know you now! This book sounds great! I like good nonfiction. This looks great. Must be the year for water books. 🙂 I love that you stay up late so I can chat with your late … but I want you to get enough sleep. Ready for spring here! I loved all of the post – but most of all, learning that you won a Lindy hop contest! My husband and I met swing dancing (mostly east coast) and financed flights to see one another when we were in grad school far apart by teaching swing classes. So fun to find another little thing in common with one of my favorite kidlit bloggers! I just read this the other day at B&N and loved it. And your idea of a nature book is awesome. I am going to try that myself! Raindrops Roll looks beautiful! I like how you describe them as “astonishing beautiful” — that sums it up nicely. 24 hour flight? Oh wow. That’s a long flight indeed!